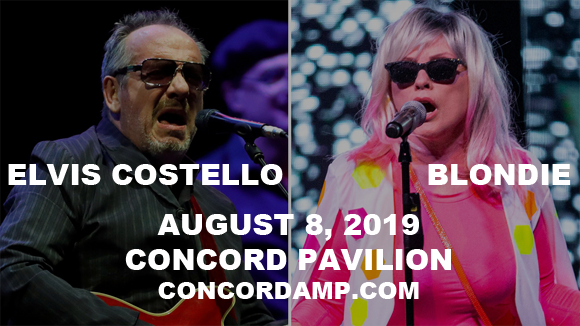 Two legendary acts of the 1970s new wave scene, Elvis Costello & Blondie, are bringing their perfectly paired co-headlining tour to Concord Pavilion on Thursday 8th August 2019! Dubbed "Blondie and the Beastly E.C.! ", the tour sees the two punk rock-spirited, groundbreaking, chart-topping acts performing a full set headlining set each, and who knows…? There may even be plans for a very special collaboration… Whatever happens, it's sure to be an unforgettable show! Pioneers of the American punk and new wave scenes in 1970s New York, Blondie was founded by singer Debbie Harry and guitarist Chris Stein in 1974. The group found success in the United Kingdom and Australia with their first two albums (Blondie (1976) and Plastic Letters (1977), but it was 1978's Parallel Lines that brought them mainstream popularity in the US. They followed with a string of hit singles, including "Heart of Glass", "Call Me", "Rapture" and "The Tide Is High", experimenting with a variety of musical genres, including disco, pop, reggae, and early rap music. After releasing their sixth studio album,The Hunter, in 1982, the group disbanded, before reforming in 1997 and returning to form with a number one single in the United Kingdom ("Maria") in 1999, exactly 20 years after their first UK number one single ("Heart of Glass"). The band continues to tour and record together, and they released their eleventh and most recent studio album, Pollinator, in 2017.